This is the third post in my series on our photovoltaic generator. It had been a part of previous post with the data for the first month, but I cut and saved it as the other post was so long already. I am now also able to present data for two months of operations: Below is an updated plot of daily energy balances in the second month. Again, I am combining data from our photovoltaic inverter’s logging and from our meters that track the difference of consumption and fed-in energy. Self-sufficiency quota: Which part of energy consumption in the house is harvested from the solar panels? Self-consumption quota: Which percentage of the PV power created can be consumed immediately. Energy from PV = data from our inverter’s data logger. Energy from / fed-into grid: Calculated from data logged by our smart meter(s). Arrows indicate which axis to use. By mid of June, our own smart meter had been installed so we did not have to read off the dumb smart meter’s display manually any more. 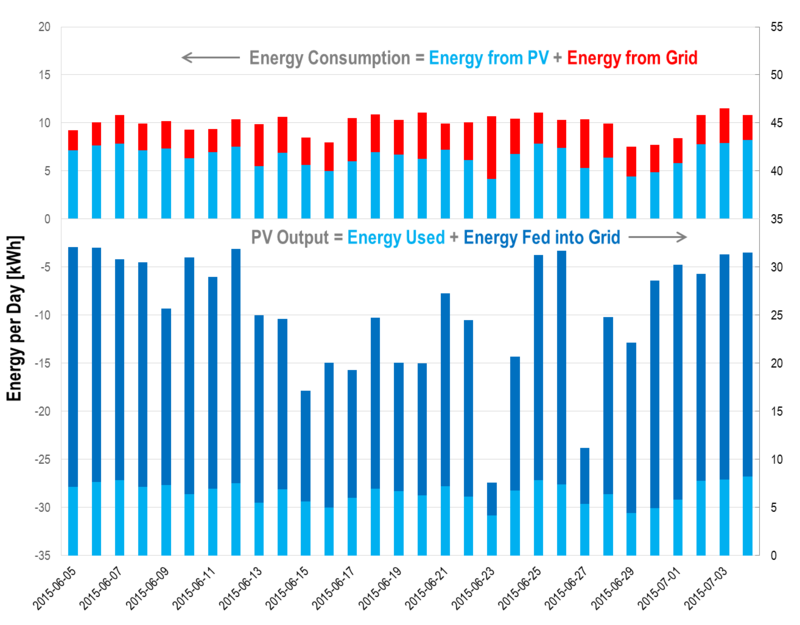 June was sunny and hot: We harvested more energy due to the higher number of sunny days, but we did not reach May’s daily high score of 32,88 kWh again: Longer days cannot compensate for the reduction of the efficiency of the panels due to higher ambient air temperatures (as discussed in the previous post). We need less energy per day on average: 10 kWh instead of 11 kWh. Either we spend more time outside than sitting in front of a computer, need less light, or (most likely) we are too obsessed with playing with our new metering gadgets and optimizing our energy consumption. As a consequence – especially in combination with a higher average PV energy output of 25,5 kWh versus 22,1 kWh – our self-consumption quota slightly decreased: We could use only 25,8% of PV power directly, versus 27,5% in the month before. For the same reason, we are more ‘autonomous’, self-sufficiency quota increased: On average 66% of the energy needed in the house was directly delivered by the solar panels (Before: 55%). Which quotas will be reach for a full year? How would those numbers change if you had a battery? Would this justify the investment? The following is my personal assessment, based on our (Austrian) market of electricity and our way of using electrical energy as home owners. I pay three times more for electrical power than I will earn when feeding in to the grid (about € 0,18 versus € 0,06). Thus the goal is to maximize the amount of energy used in house and only sell to the utility if you cannot use your power. A battery can store the surplus of energy harvested during the day, so that you can consume it in the night or when clouds pass. The ‘profit’ from having it battery is thus the difference in costs of power and feed-in tariffs (€ 0,12), multiplied by the energy you are able to ‘shift’ to the darker hours. Energy not consumed in the house is used for charging the battery unless it if fully charged already. If the solar power is not sufficient to cover current demands, energy is delivered by the battery – unless it has reached its minimum allowed capacity (80% of nominal capacity for Li-in batteries, 50% for lead-acid ones). The conversion of energy is not perfect and battery losses need to be accounted for. Before I will be able to do this, I play with ballpark numbers, see e.g. inverter vendor SMA’s planning guide (diagrams and examples p.32), or somebody else’s load profile. This tool by a German developer allows for playing with the size of the battery and PV generator interactively (the legend of the plot is in German, but the monthly balances and input fields are titled in English). Yearly energy consumption: About 7500 kWh in our case, more than 4000 kWh is for the heat pump. Yearly energy harvest from solar panel: Using one of the free PV simulation tools that take into account weather data (e.g. PVGIS provided by the European union) we should end up with 5300 kWh. Size of the battery and percentage of usable capacity. I play with a hypothetical Li-ion battery with 10 kWh, thus 8 kWh maximum energy. At the German website you can pick different load profiles, I compare different ones that might be similar to our usage pattern. the estimated self-sufficiency quota for a full year would be about 30% for our system; and it would increase from about 30% to 55% on adding a battery. we might be able to shift less than 2000 kWh per year by the battery. Note that calculations based on self-consumption quota also include the battery losses – about 500 kWh per year – so data based on the self-sufficiency quota should be used to see the real usable energy. Multiplying this with the difference in costs and profits (€ 0,12 per kWh) would result in a profit added by the battery of about € 240 per year. BTW this is less than 50% of the profit gained by using the PV generator without the battery. I researched prices of Li-ion batteries before we purchased our generator and the cheapest one I found was a 8 kWh battery (nominal capacity) for € 6500. Tesla has recently announced its Li-ion Powerwall home battery with 10 kWh, to be sold to $ 3500 to contractors. Prices for installations and price difference between a ‘classical’ inverter and one that can manage a battery not included (less than € 500 here). If you have the battery installed together with the panels, there should not be much additional installation efforts though, compared to the time needed for working on the roof. But I think a 10 kWh battery will not be cheaper than something like € 4000 unless one more ‘disruption’ hits the industry. So the estimated profits of € 240 are considerably less than 10% of the costs of the battery. Since the estimated life-time of the battery is 10-20 years it is likely not to pay itself off until it has to be replaced again. (No interest rates and realistic net present value considered.) The solar panels will last for decades and still deliver power – though at a slowly deteriorating efficiency – when the payback period has passed. We use the office during the day: I had always noticed that electricity bills from the past clearly show if we were commuting to a workplace far away or using our own office. We use a heat pump, and we schedule the hot water cycle to match the sunny hours. I think that you should try to use energy more efficiently first – before adding a battery to shift unnecessary loads. The decision for a battery should be based on an optimized load profile. For example, Tesla presents some data for a typical energy consumption of devices on their Powerwall website – see bottom of this page. A refrigerator should use 4,8 kWh a day? If I’d have such a refrigerator I would rather replace this than investing into a battery. A modern fridge should not use more more than a kWh per day. Using a heat pump in middle Europe I might have an unusual view of autonomy. But I believe heating energy in northern latitudes is often neglected in discussions about becoming more self-sufficient by using solar and wind power. If you don’t want to depend on a utility, why would you want to depend on the vendors of fossil fuel or wood – and related financial markets and volatile prices? Here, we have a very reliable power infrastructure, access to 100% green power harvested locally (wind or hydro). But oil and gas have to be imported, and the energy for heating in winter is several times the electrical energy consumed by appliances. A heat pump the best way to utilize solar and wind power for heating, but you have to face solar energy’s obvious disadvantage: You cannot store summer’s surplus of PV energy for winter (not until a commercially feasible combined fuel cell plus electrolyzer will be available). PV energy from generators that fit onto typical roofs are too small to cover heating energies in winter. Our expected PV output in the coldest months will be less than 10 kWh per day, whereas the heat pump might need up to 35 kWh (one quarter of heating energy). And lest we not forget power versus energy: The heat pump always operates at full power, with its rated power being determined by a worst case minimum ambient temperature. You will need to input something like 2-3 kW for a rather short period. The more average power you need, the more often the heat pump is turned on. So you also need 2-3 kW of solar power or battery output power – a challenge given irradiance in winter and typical battery inverter’s output powers. In summer a 10 kWh battery the capacity of Tesla’s will be fully charged quickly: You can expect half a year of autonomy, but have to feed in your surplus to the grid. In winter, the battery will hardly be charged as all power is consumed immediately. So the estimated self-sufficiency quota will be well below the absolute theoretical maximum of yearly PV energy harvest over yearly energy consumption (about 70% in our case). Expected downtime per utility client here is less than an hour per year. In winter a backup system would certainly be more interesting if you depend on a heat pump – but, as mentioned above, the battery will hardly every be charged. The storage and latency built in in heat pump systems will cover the typical downtimes easily. You use a storage of heat rather than one of electrical energy. You might need to plan carefully which devices are allowed to run during a blackout, as the output power of inverters is limited, and typically of the same order as an electric stove or a water cooker (2 – 3 kW – as high as the heat pump’s input power!). If I only want to be sure that my computer does not crash or want to have a chance to look up the utility’s website, then I’d rather go for a UPS (Uninterruptable Power Supply). A UPS is a battery you connect your important devices to directly, whereas a battery-powered backup system plus inverter needs to maintain a small AC network, controlling frequency and voltage like The Big Grid. A full-featured backup system compliant with our local safety regulations will need some components not included in vendors’ turn-key system. At least a few months ago it was hard to obtain a definitive and unambiguous statement about what exactly the full backup solution would entail. Another thing I am still waiting for is the option to use a car battery (easily) also as a home storage battery. AFAIK car batteries as the Tesla’s do not allow for bidirectional charging and consumption. (Edit Dec. 2015: Nissan’s LEAF can do that but this solution had not been available in Europe yet). But fossil fuel burnt by cars are much tougher to get rid of in Austria than fossil fuel burnt in homes. Statistics show it is seems very hard to reduce the former, whereas the latter is gradually decreasing as people prefer heat pumps or pellet stoves today. I have reduced my carbon footprint drastically in recent years: by driving much less and turning to ‘remote work’. Now we would be ready to replace one of our two cars by an electrical one, as we can plan better when and how it will be used. But why buy the battery twice – one for the car that seldom uses it and one for the home? That said, one should always keep in mind seemingly unrelated investments and not apply double standards. For example, a lightning protection system for a house like ours costs about € 4000. So if I pay that for mitigating an event due every 1000 years (estimated by a tool provided by our national weather agencies – probability of a lightning strike) – I sort of nearly feel obliged or entitled to buy a battery. I am also aware of the fragility, if not absurdity, of financial forecasts in times like this – I don’t even need to factor in the collapse of the eurozone or something. I have just heard rumours about drastic changes to be made to utilities’ pricing models. Utilities here start to lose money when serving PV system owners: In those € 0,18 per kWh fees for transmission via the grid are included. But if you deliver energy to the grid you are not charged for kWh transmitted. Transmission system operators have to swallow your energy and are burdened with managing the volatility of renewable energy. Currently running costs of electricity are high whereas the fixed costs like metering (which I factored in in that € 0,18) are negligible. An envisaged model might comprise a rather high base fee instead – no matter if you are a consumer and/or run a power plant – plus low running costs of about € 0,10 / kWh. If those rumours come true, it would become more interesting to go off-grid completely which is not an option given the constraints I outlined above (summer/winter, heat pump, high peak power of appliances). This entry was posted in Heat Pump, punktwissen, Science and Technology and tagged Battery, Energy, Energy Costs, Energy Storage, Engineering, Off-Grid, Self-Sufficiency, Solar Energy by elkement. Bookmark the permalink. It is so good to hear people talk of focusing on conservation, before investing in alternative sources of energy! Having some feedback on consumption is absolutely critical, as well. I’m not aware of any effort to install smart meters here in Portland, OR, but I can appreciate the value in it nonetheless. I was applying to a local “green apartment building” builder, and suggested the implementation of individual power and water meters in each unit. The changes to personal behavior could be tremendous. In order to save resources, it helps to know what you were using in the first place! Yes, I agree – I think we don’t have this feeling for the numbers otherwise. I noticed that many home owners purchasing some renewable energy technology did not really follow up on data, and don’t even check monthly balances (‘Well, yes, I think I need less gas now….’). Heating your roof with your solar collector and using more fuel not less, due to a stuck flap valve, is legend 🙂 Also measuring energy is not sufficient as the high instantaneous power – especially used for heating – is the true challenge; it is humbling to see those curves of power over time. My friend and I built a stationary bicycle, power generator. He provided the bike, the car seat, and the motor, while I made the framing. We used a three phase motor, which he rectified to DC for battery charging. Running on single phase circuits (without a battery), we would run various loads like CF light bulbs, a refrigerator, and a toaster. Surprisingly, the refrigerator could be run by an average person, but cycling continuously, we figured and average person could only output 50 watts for a few hours. Some gearing and a flywheel would’ve improved the machine, but I doubt I could make toast even then! The machine remains in his living room for the last few years, and I always hop on to generate a few watts, when I visit. Public schools should include machines like that in conservation classes, from an early age! Wind can complement solar energy nicely as the harvest is a bit higher in winter (due to higher density of air), but as we discussed on G+ one should be wary of trade-fair vendors of small turbines and only rely on data for real-live tests. Near the ground there are turbulences and the output of wind turbines with a small tower is unpredictable. I didn’t want to advise against storage – I just wanted to detail my own calculations to show that it really depends on so many things: Details of your usage patterns, economics, the full big picture including all of energy (incl. fuel for cars). If there would be an electric car on the market that allowed its battery for being used also as a home battery, I’d buy one immediately. But I think the most important thing is saving energy before trying to go green or adding storage. My husband was also following the news of the Tesla battery; he’s interested in it for a vehicle, and was rethinking an electric car again. (I am more interested it getting back into public transportation/walking/biking modes, and usually don’t drive if I can avoid it.) I told him about your suggestion for a battery that can work for both car and house, and he agreed that if such a system became available, there would be no thinking about it, this is what he’d do, too. (We had actually been discussing your post at the hardware store only a few minutes before you replied above.) So, let’s hope that such an option becomes available! The last line is intriguing, asking what if a car could power your house. A few years ago cars used as storage were part of every standard presentation of ‘the new ecosystem of electromobility’ (This was the time every city here had its ‘e-mobility initiative’). But storage should help the operators of the power grid to balance load and demand better – so utilities would use that storage. But those initiatives did not have much impact so far, and I would not want the utility to use my personal storage anyway. Coincidentally, while reading this post, I’m listening to the AM radio and hearing of yet more fog-related closures at the St. John’s Airport (YYT). It’d upgrading from a class 2 to a class 3 landing system and (a) the main runway is temporarily shut down to allow for the upgrade and (b) for the next 2 weeks, the secondary runway is shortened as the intersection point between runways 1 and 2 is under reconstruction. We tend to get a lot of it. Rain and snow too. The airport authority took it’s best shot at the best time to do this and unfortunately mother nature decided to have some fun. As a result, flights are being diverted to Gander international airport and passengers have to be bussed 4 hours. It happens here. So what’s that got to do with your post? Of course you know–not only do we have to face a low look-angle to the sun all year but we also have to deal with this–not a whole lot of blue-clear skies. As a result, PV is likely never going to be a great choice for Newfoundland. But still, there’s the other forms of solar power. I’ve mentioned to you already that we have significant hydro development here and more on the way. That’s good. We also have a LOT of wind. Our climate patterns guarantee that we’re pretty much always under the influence of a low working its way from Cape Hatteras in the US out into the Northwest Atlantic, crossing directly through us along the way. Sadly, though, there’s been very little work done on developing it. We do have a few wind farms but they’re the exception. The Provincially owned energy authority Nalcor, insists that wind is too expensive and is now putting all its efforts into offshore oil and gas as well as some hydro. To bad. As for personal use of PV, heat pumps and wind, also sadly there’s not much support. You’d think there’d be some research money or at least tax breaks available to assist people in doing exactly what you two are doing.. As such it’s just too expensive for most people to take a chance on alternatives, mortgage-poor as we all are. Here in mid-Michigan, United States … well, my love and I haven’t thought at all about photovoltaic because our yard is ridiculously well-shaded (which keeps the house tolerably cool most of the summer) and it would price our house way out of the neighborhood. But there is a wind farm growing to our north. My love commutes through it twice a week during the academic year. It already stretches from west horizon to east, and every year, it reaches a little farther north and south. It’s almost like there’s been a nanotechnological disaster turning abandoned farms into windmills. It is very interesting to discuss with people all over the world. “price our house way out of the neighborhood” is an argument that would most likely never come up in Austria, where people buy, build, or renovate a house once in their lifetime… which they are reluctant to sell anyway as market prices would never reflect the work they had put in themselves. As I said to Maurice above (or below, WordPress does confusing things with threads), I have read that costs per kW for PV systems in the US are twice as high as in Germany. This and your lower costs of electricity make payback times longer – assuming you would also gain only through consuming your own power, not by selling to utilities. The latter is not even profitable any more here. Given your higher mobility, systems will never be paid back in the period you live in a house on average. I agree – saving energy should always be the first solution, before looking for a smart / green / whatever solution. There is a proven rebound effect: As devices get more energy-efficient, people use them more often, have more of them or bigger ones … like 2 TVs or that huge refrigerator dispensing ice cubes. In theory smart metering should help to make consumers more aware of their energy use in a playful way, like: seeing how you compare to home owners in your area. Global radiation is what reaches the ground so fog should be factored in. The average radiation is about 1120 kWh/m^2a – the same as where I live. Also the ratio of direct and diffuse radiation is the same (40 to 60), and we are at the same latitude. If these numbers are correct and ambient temperature is lower panels could even perform better in your place. But according to the text some calculation was involved so these are not just averages from 10 years of observation so perhaps one should remain sceptical. But I have read that typical prices for turn-key PV systems in the US are twice the costs in Germany. Our main incentive here are our high costs electricity. Attractive subsidized feed-in tariffs are gone – you get the stock exchange price for power and gain by self-consumption mainly; in Germany power is even more expensive so it is understandable they are Europe’s ‘most solar’ country. But lower costs of electricity per kWh in North America would result in even longer payback times, despite a much higher mobility of people. So I totally understand that solar energy is a tough sell. We’d also have to factor in the fog which, unfortunately, was with us for almost the whole month. As is the case now in most places, government initittives are pretty much non-existant so we too pay raw market prices for everything. Wind and various sea-based power (tide and wave) is still capable to generating enormous power but the costs are still not where they’d need to be. Still–here’s a story for you. There are a pair of foreign-owned wind farms here (we mave several but I’m talking about 2 in particular) that tend to be at full capacity (that happens when the wind exceeds 40 km/h or so) for 60% of the time–an astounding statistic and–I have been told–SELL the power back to the grid (at a profit I assume) for only between $0.07 and $0.08 / kWh. NOW–I am not sure that the figures are accurate of course, but if t’s true then we re really on to something here. Locally published figures indicate that it costs around $0.20 /kWh to generate it and, since current systems only sell it at $0.11 / kWh they say it makes no sense here. But still they can easily come a time when it makes sense. Thanks, Maurice – I once did a simulation of the output energy of a wind farm to be repowered (old wind turbines to replaced by newer ones) and it turned out the newer 3 MW turbines were close to being economically feasible even without special feed-in tariffs for green energy (with larger rotors and tall towers, much better than having higher rated power but still smaller rotors). Our stock exchange price for electrical energy seems to be similar than yours – a few euro cents. 60% is a great number – typically full-load hours of wind turbines here in the – windy!! – lowlands are about 2000-2500h (out of 8760h). German offshore wind turbines obtain 3500 full-load hours…. and full-load hours are not even exactly the number of hours the turbine runs at full speef, but the number of hours it would run at full-speed in order to achieve the same yearly output. Thanks, Bert! Interesting – and unfortunately it had to be expected that utilities would respond to the PV boom someday. The fees for grid operators are set by the regulator in Austria (in contrast to market prices of energy set by power plants), so there has to be some consensus / lobbying / governmental support. But as your example shows this is not against some EU regulations so charging by feeding-in an option.